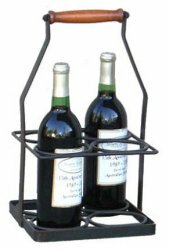 Iron & Wood wine bottle holder for 4 bottles measures 15" high x 8.5" wide x 8.5" deep (38cm high x 21.5cm wide x 21.5cm) deep. Want Cheaper Delivery? The more you order, the cheaper delivery becomes!! Please check out delivery pricing in shopping cart for multiples of this item or a combination of various accessories. We have minimum shipping cost in place so initial delivery may seem high if ordering a single item. Add two of the same item or other accessories to the cart and your shipping rate will go up marginally.